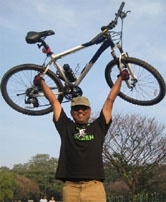 GoGreen Campaign Ride towards Thurahalli Forest & supporting BBCH race.. - GGI-Group size: 4000+ Professionals, Increasing on day to day basis, Come & join us 2 serve Mother Nature. 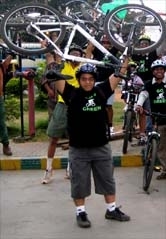 GoGreen Campaign Ride towards Thurahalli Forest & supporting BBCH race..
Around 25 GGI's met near the starting point and started off to Thurahalli forest to support BBCH - off road race. As we reached the venue we saw several cyclist standing with their cycles to participate in the race. 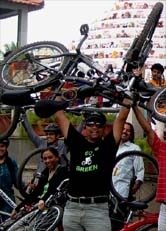 50 to 60 cyclist participated out of which 10 where from GoGreen team. We had couple of GGI's who were present as vol enters like Chiddu who had taken up initiative to conduct a race for kids aged from 8 to 12 yrs hence was busy setting up the track meanwhile We all wanted to go on the race route to have a feel of the ride . It was 3.5 Km's stretch The route was amazing with lots of stones, razar sharp bushes which needed almost full 100% concentration.